Ronnie Wood's paintings rock US Jump to media player Rolling Stones guitarist Ronnie Wood opens his new art exhibition "Faces, Time and Places" in New York. Ronnie Wood's long-lost teenage diary Jump to media player Ronnie Wood's diary, which he wrote in 1965 aged 17, is being published after he found it having not seen it for many years. The art of rock'n'roll Jump to media player Artwork by Rolling Stones guitarist Ronnie Wood goes on display in London, a route through Berlin in 10 minutes - and other arts stories from around the world. Ronnie Wood on a passion for paint Jump to media player Rolling Stones guitarist Ronnie Wood talks about his passion for painting and being clean. Snapshot of The Rolling Stones Jump to media player An exhibition of photographs has opened at Somerset House, to mark 50 years since the Rolling Stones first performed in London. 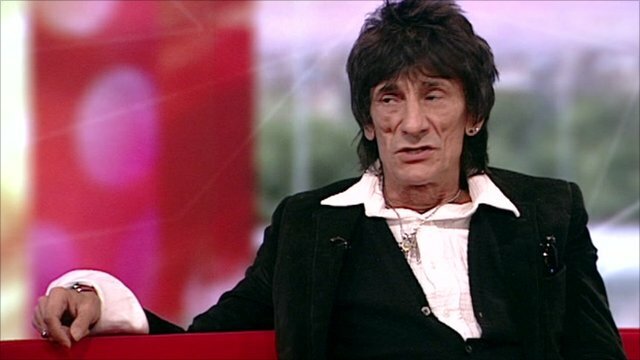 Ronnie Wood performs live on Marr Jump to media player Ronnie Wood performs live on The Andrew Marr Show in a tribute to blues musician Jimmy Reed. Rolling Stone Ronnie Wood has described his painting Sad Guitar to the Today programme as a combination of his two greatest loves, music and art. 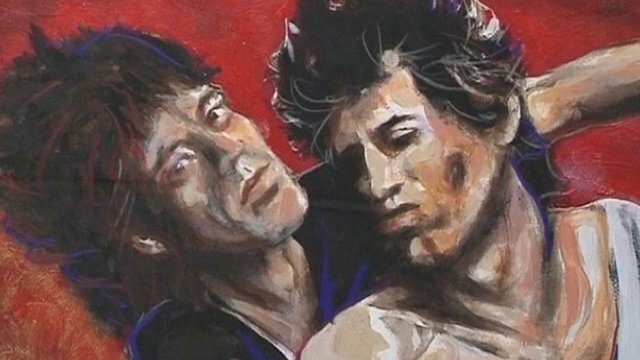 The painting will feature in a collection of art works in his new book Ronnie Wood: Artist.